We spent this past Sunday photographing wildlife and scenery in Rocky Mountain National Park. These are some of the best images I shot. We were astounded by the number of animals out in the open, seemingly unafraid, and easy to photograph….at least a couple hundred elk, two coyotes, several mule deer, many beautifully-colored Black-billed Magpies, and dozens of small and colorful Rainbow Trout at Sprague Lake. On the way out of the park, we stopped to photograph a herd of elk comprised of 52 females and 7 males. With my 80-400 Nikkor VR lens, I was able to get full frame shots of the elk. The weather was amazing, the light golden, and the photographic opportunities endless! 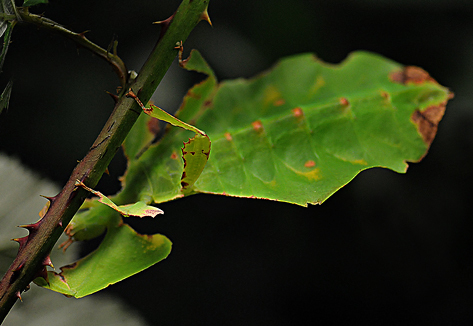 By far one of the coolest bugs at the Butterfly Pavilion—a Giant Leaf Insect (Phyllium giganteum). Females can be brown or green and grow up to five inches. I found a brown-colored leaf bug mimicking a leaf blowing in the wind on youtube.com here. The one I photographed below did the same dance inside a wind-free terrarium. Isn’t it neat how the edges of its body replicate the decay in a real leaf? 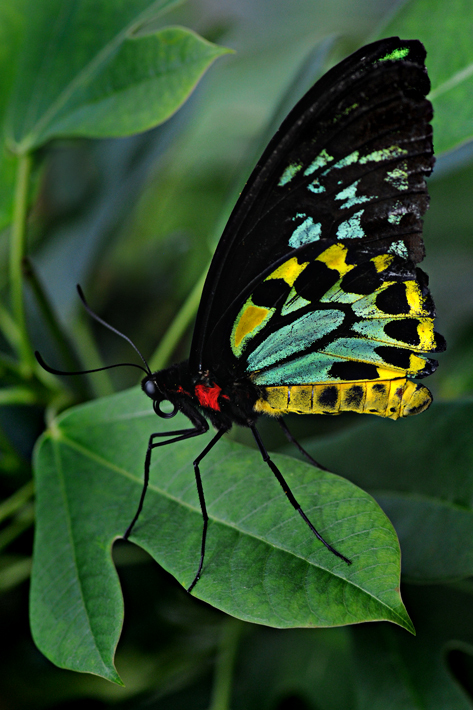 I photographed this handsome male Cairns Birdwing Butterfly (Ornithoptera euphorion), Australia’s largest native butterfly species, at the Butterfly Pavilion on Monday. Adults live 4-5 weeks and mating can last up to 36 hours (yowza!). Okay, I know these are geese…but the expression isn’t “getting your geese in a row,” so I’m taking liberties here…simply because I can. This weekend Michael and I were in Denver (actually, Englewood) for an awards ceremony held Saturday at The Inverness Hotel and Conference Center. I was nominated for a “Focus on People” award by my Hearing Loss Magazine editor, Barbara Kelley. There were five categories: Student, Adults, Advocate, Practitioner, and Pediatric Practitioner. I learned a little over two weeks ago that I was the grand prize winner in the Adult category. What an honor and a complete surprise! Barbara interviewed me several months ago under the guise of writing an article about professionals with hearing loss. Little did I know she was actually filling out the nomination form for this award. I had received a package from Oticon earlier in the week and didn’t open it immediately since I thought it was just a copy of their already-in-place ad for the magazine we were ready to send to print. I felt the package, noted that it didn’t have a CD case in it, and assumed it was an ad insertion order. It sat on the coffee table for two days before Barbara suggested that I open it. That’s when the whirlwind began. Before I knew it, we were booking reservations to attend the ceremony—airfare and accommodations courtesy of Oticon, the sponsor of the awards program. The Oticon representatives and staff were incredibly gracious, hospitable, and generous. I was a bit overwhelmed by the attention but happily soaking it in anyway. Oticon was founded in 1904 in Denmark by Hans Demant, whose wife was hearing impaired. Oticon’s headquarters is in Denmark, with the U.S. headquarters in Somerset, New Jersey. Oticon produces many types of advanced digital hearing aids, some with artificial intelligence. Friday night we attended a reception and dinner where I met Oticon’s PR person, Sara Coulter, who did a wonderful job of organizing the event and made us feel so welcome. The awards luncheon was Saturday at noon. We were each asked to give a brief acceptance speech, and although I am by nature not a shy person, I was incredibly nervous—embarassingly so. And, of course, I was first to give my acceptance speech (Murphy’s Law, you know). I had spent a couple of hours writing the speech the night before, rehearsing it to my audience of one (Michael), and having him time it over and over again so it didn’t turn into a recitation of War and Peace. Despite all the rehearsal, I was a trembling bag of nerves at the podium. So when I mention I was a bit overwhelmed, that’s actually an understatement. Add the common fear of public speaking to the honor of the award in the first place, Barbara being so kind to nominate me, all the attention being showered, and being designated to go first—surely you have a recipe for potential disaster! I started out nervous and calmed down (if only a bit) as the clock ticked. I was followed by four very eloquent and moving speeches from my fellow award winners. I only wish I hadn’t been so nervous. Afterward, I thought of all the things I wish I had said. Isn’t that always the case? Do-over, do-over! Each winner will receive $1,000 cash prize and Oticon will also donate $1,000 to the charity of our choice. All that and airfare, accommodations and wonderful meals! Without a doubt, this past weekend was an amazing one for my this-is-your-life book. I’ll post a photo shortly of all the award winners with the president of Oticon, Peer Lauritsen. Thank you, Barbara, for nominating me. And thank you, Oticon, for recognizing my work and honoring me with this award. The photos below were shot just outside the hotel, near the golf course, after we had lunch in Baca, one of themed restaurants at The Inverness. Click here to view their video on how to make churros! The Inverness is a beautiful hotel with an excellent staff and it was such a treat to spend the weekend there. We rented a car late Saturday afternoon and spent the evening in downtown Denver, where we perused two of the three Tattered Cover Bookstores (Colfax Avenue and LoDo locations), and had dinner at The Old Spaghetti Factory. On Sunday we drove out to Rocky Mountain National Park, where we were giddy with excitement over the abundance of wildlife to photograph. We spent Monday morning stalking various Lepidoptera at the Butterfly Pavilion in Westminster before catching a flight back to D.C. in the evening. Stay tuned for photos from our field trips! The temperatures are finally starting to feel more fall-like in Virginia. A few nights ago, we gathered up the three passion flower vines and brought them into the studio so they could continue their growing indoors through the winter. I cut the last of the catnip and made our cat, Jasper, a very happy boy this afternoon. And although there are still a few things in bloom, the garden is growing weary and fading fast. The only things blooming now are daisies, butterfly bushes, yellow mums, and balloon flowers in the front. And the only things blooming in the back yard garden are a red cardinal plant and one solitary Marguerite daisy. It’s nearing that sad, sad time when my garden goes dormant. I’ll put the garden to bed for the winter by next week. When the evening weatherman reported impending frost a few nights ago, Michael ran out to pick the remaining (green) tomatoes (for his homemade tomato relish), as well as the rest of the green beans. With flashlight in hand, he picked what he could find easily in the dark, then I assisted by shining one of my studio modeling lights through the window. 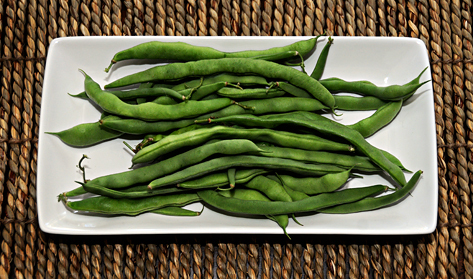 To add to the harvest, I found another dozen beans today on a vine hiding by the heat pump. Without further delay, I present to you the final bean harvest—enough for dinner for two…and a beautiful poem by Irish poet and playwright Louis MacNeice (1907-1963), followed with a quote by one of my favorite writers, May Sarton. A very fine (birth)day, indeed! On Sunday my friend Karen treated me to a day-before-my-birthday lunch and a matinee showing of The Secret Life of Bees. Michael and I read the book, written by Sue Monk Kidd, when it came out in 2002 and loved it. I vowed that if no one ever made a movie based on this story, I would scrape together enough money to buy the rights and make it myself (pipe dream, I know). Thank goodness I never had to do that. The screenplay writer, director, and actors did a superb job bringing this story to life. Then this afternoon Michael and I spent several hours at one of my favorite places to photograph, Green Spring Gardens. Although Michael and I had grand plans this morning to hit the road on a day trip, I’m glad we spent the time rambling around this local garden instead. There was so much still in bloom and so many bugs and butterflies to photograph. The afternoon light was amazingly golden, too. I was happy to see two new butterflies I hadn’t seen before (don’t worry, I’ll identify them later—unless someone wants to beat me to it—consider it my birthday present!). To top off my perfect day, I had dinner at Macaroni Grill with Michael, and dear friends Regina, Jeff, and Tom. I had the parmesan-crusted sole—it’s a new item on the menu and it was delicious! Hmm. I don’t remember planting that. Honestly. Although I have been known to squeeze plants into every square inch of our gardens, I have no recollection of planting this one. I just noticed it blooming last Thursday. It looked familiar. It looks like the beautiful purple Ageratum, which I no longer even bother to grow. Why? It never thrives in any place I put it. It’s an annual. It looks terrible when it’s not in bloom. Yes, it’s beautiful on the nursery shelf. It’s a whole ‘nother thing when I add it to my garden. So each year when I’m out buying plants to fill all those imaginary holes in my garden, I put blinders on when I see that spectacular flash of purple-blue. So I’m walking around the garden Thursday morning and see this familiar plant—the one I no longer purchase each year. Only this one is huge. Shrub-sized. It can’t be Ageratum. But it really looks a lot like Ageratum. When I was at Nalls Monday photographing baby Jonathan, I saw the same plant. The tag identified it as a Hardy Ageratum (Eupatorium Coelestinum). Hmmm. Didn’t know it even came in a non-annual, hardy version. Finally, an Ageratum that thrives despite neglect. I do not remember purchasing it. I do not remember planting it, either. Perhaps a garden fairy brought it here? A wayward Weedette from my Garden Club, looking for a caretaker for her overages? Anyway, here’s a photo of said plant—and yes, I am well aware that this photo won’t win any awards. By the way, in my online research I learned that although this plant’s common name comes from its remarkable resemblance to the annual Ageratum, it is not related to it. 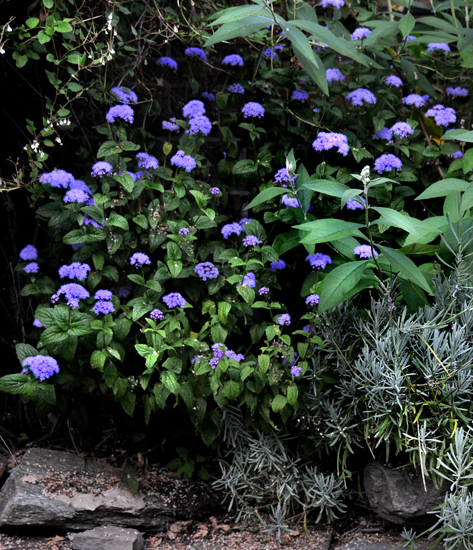 Hardy Ageratum prefers moist soil, and although it likes shade for most of the day, it will tolerate some sun. (I question that fact since it is thriving in full sun all day long in my garden!). Forming a clump about three feet tall, it begins to bloom in September. A member of the Aster family, it is a magnet for butterflies. How fortunate is that for this butterfly-crazed photographer? P.S. I also read that, after a few years, it can expand aggressively via underground runners. Rut roh.